Christ revealed the fiery consummation of Sodom as a similitude foreshadowing His coming at the end of the age. He likened the escape of Lot and his family to a greater escape for the faithful elect during the Apocalypse. Although all readers should heed the message as instructions to escape worldliness and prepare for tribulations, especially those who live in Babylon, the foreshadowing of Sodom and Gomorrah specifically tells Bible-believers in southern Israel to escape a great army- “a flood” of troops. Hence, the message is both global and local for believers in Jerusalem. If only one historical message is gleaned from the story of Sodom and Gomorrah’s ruin, it is a warning from the messengers of God to “Escape!” The two famously wicked cities, biblically known for their blatant homosexual behavior, injustice, lax indifference to evil, and violence, were provided in Scriptures as Divine examples for the world at the end of this present age, and the message is for faithful Jews and Christians of the Apocalypse to escape the Babylonian world system- to prepare for Christ’s coming and escape. The message of Sodom is echoed in the Book of Revelation, wherein a great voice from Heaven cries out, saying, “Come out of her, my people, that ye be not partakers of her sins, and that ye receive not of her plagues. For her sins have reached unto heaven, and God hath remembered her iniquities” (Rev. 18:4-5) KJV. In fulfillment of the shadows of Sodom and Gomorrah’s destruction, God is sending His two messengers to warn all of His people of the coming evils that He is allowing to come upon the wicked world. Those who heed His message and obey, like Lot and his family, will escape His forewarned Year of Recompense. A fiery consummation of a wicked age came quickly upon the people of Sodom and Gomorrah, but the family of God, like Noah before them, was warned with instructions to escape Divine destruction. 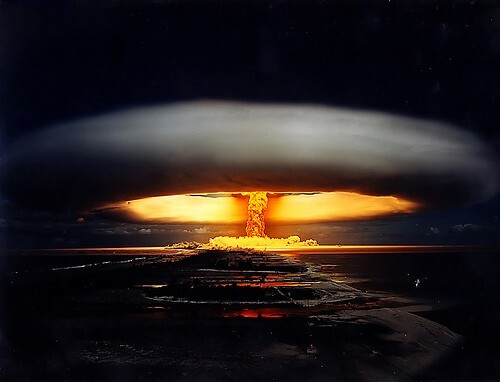 In every cataclysmic event in Scripture, there is a division between the obeying and faithful people of God and His callous, indifferent enemies; so shall there be during the Apocalypse week. 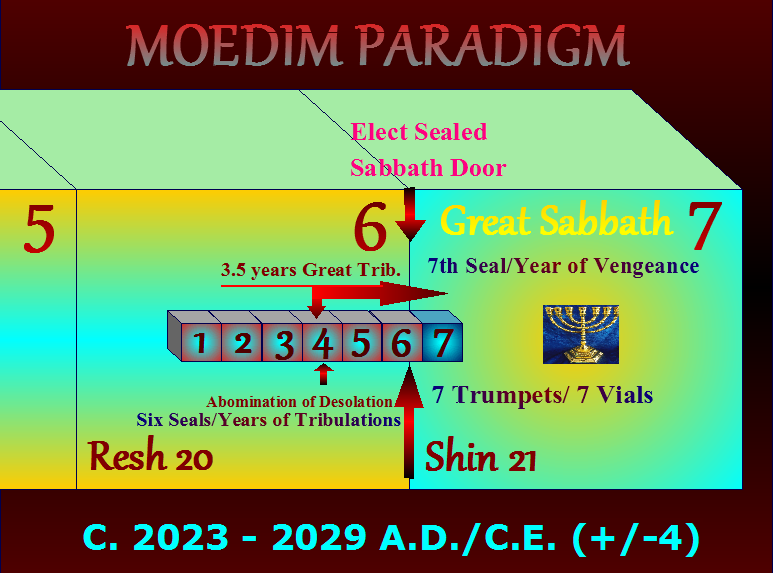 There are three divisions of time during the seven years/seals of Revelation: The first 3.5 years are tribulations and persecutions that come upon the elect, during which the final world war will begin; the second half of the week, also consisting of 3.5 years, is a time of great tribulations for the world and mass martyrdom of the elect; but the last year of the seven years is a time of escape for those who heed the trumpet warnings of the messengers of God. The last year- the worst- is the Year of Recompense, when God will avenge His people and conquer the nations of the Beast and False Prophet. Two distinct destinies await: one for the people of the world and one for the people of God. Both life and death are placed before us. A promised birth of the Holy Kingdom of God will become manifest with the promised defeat of a world in rebellion. The spiritual enemies of God will also seek to give birth to a counterfeit world dominion of peace, ruled by fascist elitists, but their works, absent of God and full of perversity, will end in shame and utter destruction. From them will come the Son of Perdition (a.k.a. the Destroyer, Apollo, Abaddon, Antichrist), but from us will come the Body of Christ (a.k.a., The Family of God, Bride of Christ, Children of the Kingdom) to reign with the King. As the prophecies foretell, we shall overcome them at the return of the Messiah, although for a short time leaders of the world conspire and scheme for their own glory. Most of the world will escape the wrath of the Antichrist, even as the elect increasingly face persecution and martyrdom, but the people of God have a greater escape, when His recompense and vengeance is stirred with zeal to fulfill His will and the appointed times. The world will be blind and ignorant concerning the things coming, but the people of God will have the light of understanding, as during the exodus from Egypt. As we shall see, God delivered a message of life to Abraham and Sarah, with an announcement that she would finally have a son, even as He and his two angels delivered a message of death and destruction concerning their neighbors in Sodom and Gomorrah. 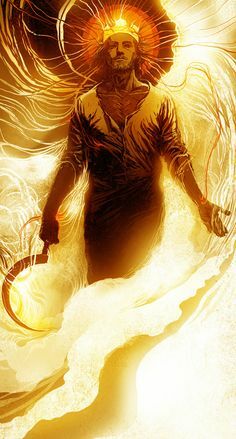 The righteous were warned and given a message of new life, specifically Isaac, but the wicked had no idea that their world would so soon be smitten to ash. Abraham, a stranger in the Promised Land, sat in the door of his tabernacle, and from there He saw the Messiah appear with His two anointed messengers, just as Peter saw Christ with Moses and Elijah on the Mount of Transfiguration. During the fulfillment of the Feast of Tabernacles (Sukkot), Bible believers- many being foreigners to Israel- will be gathered to the door of the coming Holy Kingdom, awaiting the fulfillment of Israel’s King and messianic destiny of dominion. Like Abraham, they will lift up their eyes, for their Redemption draws near (see Luke 21:28). At that time, two witnesses will announce the Messiah in Israel, and every knee will bow at His arrival, as the example set by Abraham. In Revelation we find that Christ stands at the door and knocks, seeking to dine with His elect on the Word of God, but here we find Abraham with an open door and an opened heart. In this similitude, Abraham shared his bread, but in fulfillment of the shadows, Christ promises to share the “Hidden Manna” of God’s Word. Abraham sought to comfort his holy guests, but the Messiah promised to send “the Comforter”– His Holy Spirit- to comfort the elect during trying times, and to open up the Scriptures. Abraham sought to offer rest from the heat of the day to the Lord and His two messengers, but Messiah promises a greater Sabbath rest after the Apocalypse, for the children of the Kingdom. Abraham, the Father of Many Nations, wished to wash the dust off the feet of the Lord, but the Messiah washed the feet of His elect- meaning, He will cleanse the end-time Body of Believers. The waters of the Word are for washing the feet, along with tribulations to refine His people as burnished brass. Indeed, God guides our feet in His truths (cf. Zech. 3:10; Rev. 3:20), and during the Sabbath all of His elect will learn of His works and rest under the fig tree of Israel (Zech. 3:10). I cannot here go into all of the symbolism of the fatted, sacrificial calf, but I encourage readers to see my earlier article on the Baker and the Butler, if interested in exploring cattle symbolism in greater detail. However, I will assert that there is a transition coming, when the lean people of God- like cattle- are made healthy and fat (see Mal. 4), but those who have grown fat and wicked will fall with Babylon and the Beast, as ashes under the feet of the righteous. As for the butter and milk, the former is a sign of the promised Messiah (see Isa. 7:13-15), and the latter is a sign of the promised Kingdom- “a land flowing with milk and honey”- and those who are nourished on the sincere milk of the Word, who grow as trusting infants on the doctrines of God. After Abraham was confronted by God, Sarah became afraid and denied laughing at the revelation of a promised son- that she and Abraham would finally have a child in their old age. Likewise, many Christians and Jews stand in the doorway of heavenly revelations and mock at the return of Christ to reign on Earth. They hear the Divine truth, spelled out in Scripture, about the birth of a Kingdom of saints, yet they do not believe it is possible considering the ancient age of Israel and their long- and mostly abandoned- wait for Messiah. Indeed, the world has grown old, and many prophecy enthusiasts look for its soon destruction rather than its prophesied restoration. In fact, most Christians deny that Christ will return to reign on Earth, and Catholics mock it quite scornfully. Further, most Jews in Israel and the West, according to research polls, are atheists and secularists, with comparatively few still believing in a coming Messiah (the return of Christ). Like Abraham and Sarah, too many past attempts have been made to bring forth the Kingdom, ending in failure (see 2 Pet. 3:3-4). Thus far, the nation has been born, but the Kingdom has not come, for the Kingdom cannot come without the King and His royal family. The nation of Israel was suddenly declared in May of 1948, but the Kingdom of glory has yet eluded the faithful. This is what we await, along with all the children of Israel restored in their tribes. Christ is the reason for several biblical stories of unexpected births of sons, often after holy women of old had given up on the Lord. Nonetheless, God has not given up on His plans for a holy nation, and they will all be fulfilled at their appointed times. A tiny nation will become the seat of a global dominion under the wise and just, awaited Great King. After announcing the birth of Isaac, God gave Abraham a second revelation, concerning the destruction of Sodom and Gomorrah. The patriarch, like all believers who will listen to God, was warned of what was to come upon his wicked neighbors- those who celebrated their lasciviousness and worldly lusts. As Prophet Amos wrote, surely God will do nothing (concerning His people) without disclosing His secrets to His servants the prophets. Wisdom and obedience to the instructions of God come by hearing more than the good news of promised life; we must heed the entire Word, with its warnings of God’s judgments and destruction coming upon an indifferent and rebellious world. After learning of God’s plan to destroy the wilderness cities, Abraham interceded for the righteous citizens within them. In doing so, he gained God’s promise of deliverance and assurance of salvation for the righteous. In fact, the righteous patriarch dwindled down the number of the cursed cities’ righteous inhabitants, required of God, in an attempt to save each city from utter destruction (i.e., 50, 45, 40, 30, 20, and 10). The numbers reasoned over, plus the four of Lot and his family (those later deemed to be righteous), come to 199. With the promised Son of God, which the awaited birth of Isaac foreshadowed (see Lamb of Moriah Parable), we reach 200: a tithe (i.e., 1/10th) of 2,000. And 2,000 is the number of years from the time of the cross until the Lord destroys His enemies during the Apocalypse and grants grace to His people in a new world of justice, truth, and peace. After all, the reason for God revealing the destruction of the cities to Abraham was because through him (i.e., through Christ, his Descendant) many nations would be blessed. In other words, God orchestrated this entire encounter and bout of reasoning for salvation, with an unexpected message of an awaited son, because He was pointing to the nations that would be blessed through Christ, with the saved entering the coming Kingdom upon completion of 2,000 years. Unfortunately for Sodom and Gomorrah, the righteousness of ten was not found within them. The cities had grown completely corrupt, and only the few righteous in Sodom- Lot and his family- could be saved. Although the cities were perverse and unjust, God proved more merciful than Abraham who bargained to save them; He saved the family of Lot although less than ten righteous people were actually found within the city, showing that He would indeed save any who were found righteous. Further, His messengers were not sent to merely destroy; they also provided a warning and means of escape for Lot and his family. They encouraged Lot to call out any other family members who might simply believe. From a panoramic perspective, the “two witnesses” of the Apocalypse will prophesy and bring judgments of God upon the whole world, but in the perspective of local Jerusalem, the city is spiritually seen as Sodom and Egypt before the Holy Kingdom is established on Earth. Just as two spies were sent to Jericho, and Rahab the Harlot hid them before she and her household were saved in battle, the two witnesses- Moses and Elijah- will take refuge in Jerusalem during their 3.5 years of prophesying. Sodom, Egypt, and Jericho all point us to two agents of God sent to deliver the elect and provide a means of escape, even as the enemies of God are destroyed (i.e., the two angels to Sodom, Moses and Aaron to Egypt, and the two spies send to Jericho by Yehoshua). As written in previous articles, the two witnesses will bring messages of death to the rebellious along with a message and means of escape for the faithful people of God. Just as Lot and his family followed the two angels, the spiritual people of Jerusalem will find refuge in the wilderness and mountains east of Jerusalem. At a certain point during the Apocalypse, 3.5 years, they will have to forsake their lives in order to gain new life. 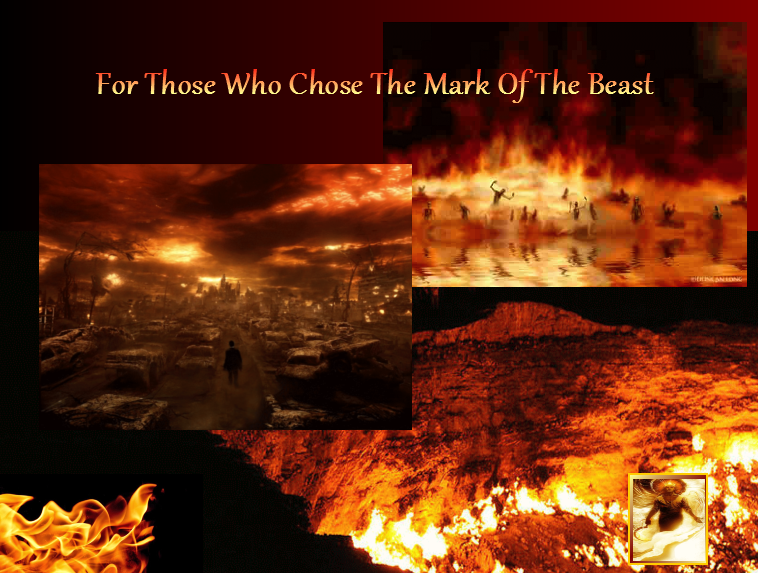 To better comprehend what Christ was warning, we must consider the “abomination of desolation” and current events (in today’s world) as we come to the end of this age. Dual prophetic fulfillment is a common aspect of prophecies in Scripture, so we would be justified in asserting that Christian Jews of the first century heeded Christ’s warnings and escaped Rome’s 10th Legion- fleeing into the wilderness and Pella of Jordan; however, nothing about the destruction of Jerusalem c. 70 AD (CE), of that which is left in historical records, points us to the fulfillment of Daniel’s famous Abomination of Desolation prophecy. Hence, we who understand the appointed times, signs, and correlating prophecies should consider things that make sense now for scriptural fulfillment, in our own generation. The fact is, Jerusalem is surrounded by Muslim nations, except part of the Great Sea coast to their west, and many Muslims believe that the Temple Mount, where the Islamic Dome of the Rock currently sits, is their third most holy place of worship. Further, most Muslims believe that Jews do not belong in what they erroneously and militantly consider “Muslim lands”- i.e., the so-called “land of Palestine.” In fact, tens of millions of Muslims, according to their religious teachings, believe that all Jews must be killed, with Christians and all people submitted to their deity Allah before paradise can come to Earth, which is an especially popular teaching among Shiites in Iran. In the Divinely-orchestrated parable of Lot and his family’s escape, we actually see another spiritual view of the way in which God sees the coming escape of the Jerusalem Bride into the wilderness, during the Apocalypse. Lot, whose name means veil, expresses the fact that Bride of Christ is not unveiled to the world until after the great escape and the return of Christ. She is veiled. In fact, the word Apocalypse means unveiling. 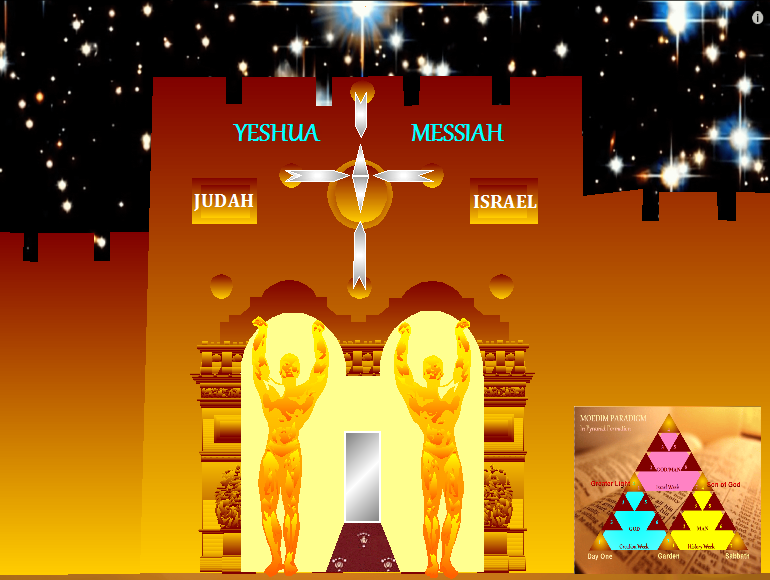 Like Lot, true Christians and messianic Jews stand at the gate- i.e., the entranceway of Christ, awaiting glorious salvation, and they will recognize the two witnesses of God in the same manner in which Lot recognized the two messengers, with spiritual insight. Unlike the wicked world, they, like Lot before them, will invite the two witnesses into their lives. When the two witnesses appear in the House of Judah, they will be opposed by enemies within Israel, especially within the city of Jerusalem, as well as by the entire world. The worldly will coax and seek to persuade the faithful to surrender them, just as Lot was tested, and just as Rahab was tested to give up the two spies. The renegade world will seek to submit the two messengers to the world’s fornications, in rebellion to God. The Lord’s message to the elect, however, is for His people to come out of the Babylon, so that His people do not share in the plagues of her fornications. The fascist homosexuals of Sodom sought to force their way upon the two angels of God, yet Lot was determined to protect them by all means, even subjecting his virgin daughters to their perversity, if only it would appease them for the night. Indeed, Sodom sounds very much like homosexual activists in Western nations, who seek- and often succeed- to force their worldview on Christianity, traditionalists, moralists, and conservative Jews. They, with the help of activist judicial tyrants- secular progressives who legislate from the bench- have perverted holy matrimony, and they routinely target Christians to force their small business and services, i.e., to make them participate in that which we know to be abominable. 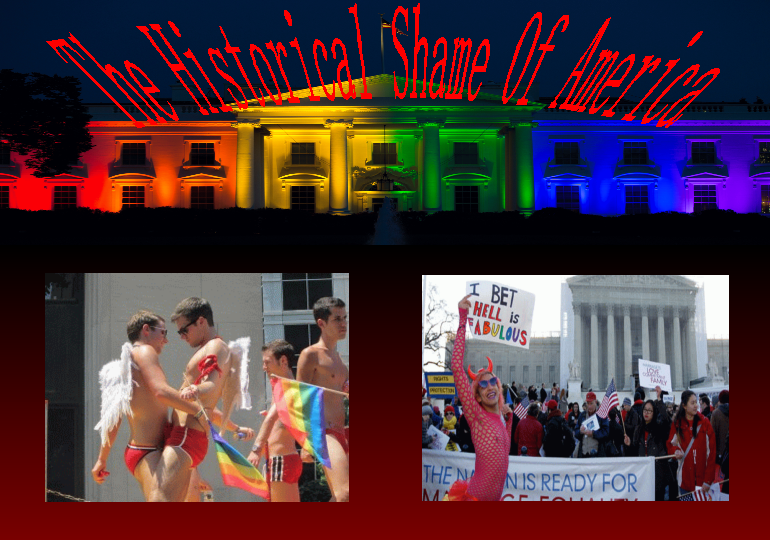 Indeed, the entire Western world, and much of the rest, has become like Sodom and Gomorrah. Many traditional church denominations and synagogues have surrendered already, allowing homosexuals to teach and lead in their congregations. 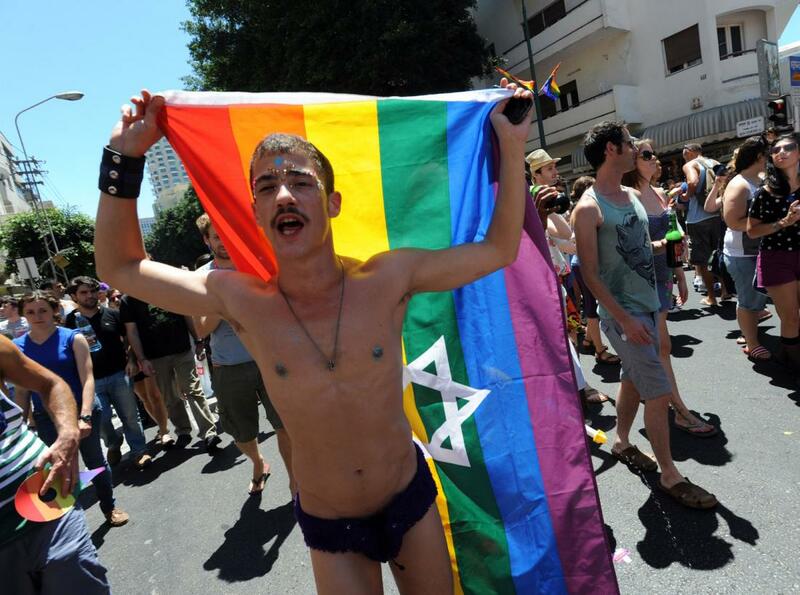 In several progressive nations, Bible-believers cannot preach the beliefs of our ancient faith, lest they face fines and imprisonment for so-called “hate speech.” This is the wicked world of today, where homosexuals, like the old and young of Sodom, parade their perversities down public streets, from Jerusalem to San Francisco and throughout hundreds of cities between. Meanwhile, more and more of the faithful sacrifice their sons and daughters on the altar of progressive political correctness- a new worldly religion of ungodliness that demands complete compliance. In one biblical generation, they came out of the closet of societies and went straight to the parade, and even our elementary students are now indoctrinated to perceive such things as virtuous. Remember the parable of the ten virgins, how the five with light entered the bridal chamber. 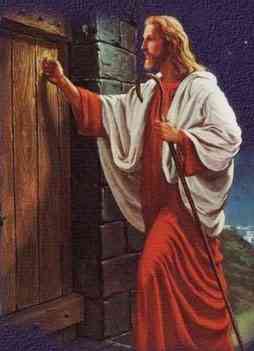 The door was shut to the wicked, just as God shut the door of the Ark as the evil generation perished in the storm. 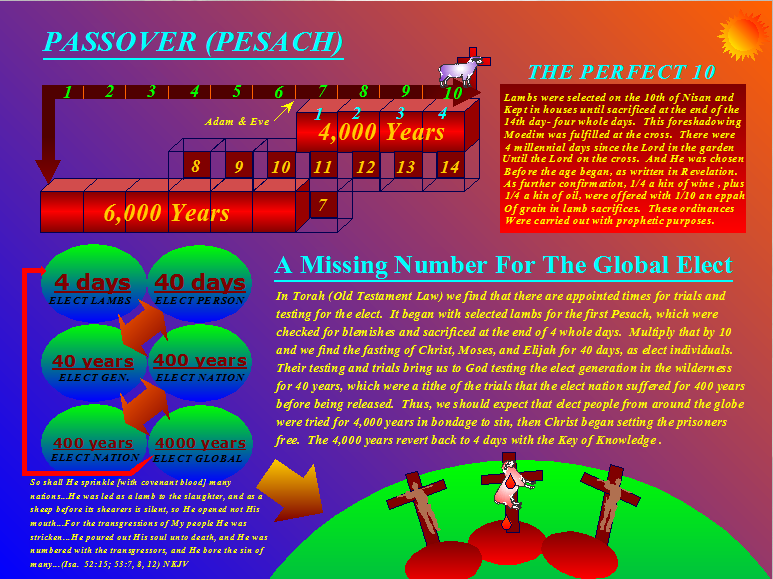 The time approaches when God will no longer allow the sacrifice of His sons and daughters on the worldly altar of perversity. The time is coming when the wicked will no longer be called to spiritual insight. As for the virgins daughters of Lot (the veiled representing the covenant Bride of Christ) in correlation with the work of the two witnesses, many Bible believers (spiritual virgins rather than idolaters with foreign deities and doctrines) will offer themselves to protect the two witnesses and their prophesying. The Household of God will indeed suffer persecution during this time by the fascists of the worldly religion of progressive political correctness. The physical blindness that the two messengers struck the city with is symbolic of the spiritual blindness in which the world now faces. Christ is the Door of His people, as written in John, but the world cannot perceive Him and His means of salvation. They stumble over the Divine Word, not knowing that God has decreed their destruction, which shall come upon them in a very short time. They walk as if intoxicated, drunk on the foolishness and vanity of this perishing age. We can preach to them in futility, but only God can open spiritual eyes. Remember the story of Elisha, how he prayed for his servant to see, and his servant saw horses and chariots of fire covering the mountain and surrounding the prophet (see 2 Kin. 6:17-18). Unless God calls, man can perceive none of His things, for the wicked are lost in their rebellion; they do not perceive how little they perceive, and they do not discern the heavenly things in which they have not known. This is not only true of secularists and Muslims, but perhaps it is true of most people who today call themselves Christians and Jews, who have very little knowledge of God and spiritual insight to discern His ways. This is not an insult, but it is a reminder that we should pray to be found worthy to escape the darkness of ignorance. A time is coming (120 Jubilee Years, 6,000 year from Adam) when God will no longer strive to save them. In the story of Sodom and Gomorrah, we often think of the wrath of God, but the truth is the Lord only required ten righteous people in order to save an entire city full of corruption, violence, and perversity. When the entire harvest is rotten and ruined, there is nothing left worth saving. We preach the Gospel of Jesus Christ and His coming Kingdom of righteousness, but the world mocks and resists God’s will. For almost 2,000 years the Gospel has been preached, reaching every nation, but God only calls the humble and those who seek justice and truth. Eternal life in a glorious age awaits those who awaken to God and obey His Spirit, but too many people in the world love wickedness and do not want God’s salvation. They lightly esteem the message and warning. We preach of the destruction to come, but our message is not heard except by an elect few. Many of Christ’s Jewish and Christian family will not answer His call to escape the Babylonian world during the Apocalypse, just as many citizens of Jerusalem will not escape with the two witnesses to the wilderness, when they see the Abomination of Desolation. They believe selected passages of Scripture and promises therein that they find acceptable, but the pull of the world is too strong for their lukewarm hearts. They, like many Israelites in the wilderness, look back to the pleasures of Egypt. The prophesies are lightly esteemed, for their hearts are filled with the present things of this perishing age. For almost four millenniums, the story of Sodom and Gomorrah’s destruction, with fire and brimstone raining down from the heavens above, has spread and served as a deterrent from wickedness for the elect of God, that they would shun perversions in this world for a better judgment to come. Ancient kingdoms and empires, such those of Greeks and Romans, began to shun their pagan ways of orgies and homosexual perversities at the spreading of holy Jewish Scriptures, and nations from the East to the West refined their cultures and social norms according to the biblical pursuit of righteousness. Nations, kingdom, and empires, however, rise and fall- here today in this century and gone tomorrow in another. Everything that they believe in their age is subject to reexamination by future generations. The Word of God, however, endures forever, and, as Scriptures inform us, God does not change. His righteousness and judgments are perfect in every generation, and no one can stay His hand from fulfilling His prophecies and will for a Holy Kingdom on Earth. His message is the same for those whom He calls, and has called, to escape the dementia of this present age of secular civilization: “Don’t look back!” The same message was preached by Noah, by Moses and Joshua, by those who led the captives out of Babylon, by Christ and His apostles, and by every messenger called to lead the elect away from the wicked ways of this rebellious world. This was the message to Lot and his family, and it echoes forward for the coming division of souls during the Apocalypse. Again, the elect had to escape to the high grounds, to mountains of the wilderness. They could not linger in the city or the surrounding plains. Rather, they had to be completely separated unto God, which points to the consecration of the elect at the end of the heavenly workweek. Hence, this informs us that salvation is not a one-time event of making an effort; it must be completed with obedience to the messages of the prophets. Remember, not all of the Israelites who escaped Egypt were blessed to enter the Promised Land. An entire generation died in the wilderness because they dishonored God and His means of salvation, with their hearts left behind in the wickedness of their former lives. Before the Messiah told the repentant criminal on the cross that “today you will be with Me in paradise” (see Luke 23:43), He had to first suffer His own tribulations in the world. He had to forsake the easy route of capitulation to the masses and appeasement to secular rulers. 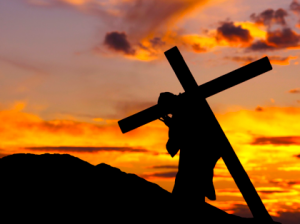 He had to take up His cross. If we are to do the works of God and participate in bringing forth the righteous Kingdom, we cannot have our hearts lingering in the dark kingdoms that are being replaced. As the old adage goes, “home is where the heart is.” A man will walk through a raging storm and push back against the gates of Hell to return to the place of his love, while another man, in the same place that he seeks, is a spiritual foreigner, for his heart is set on another place. Hence, those who do not have it in their hearts to serve God, and joyously obey, are not worthy of calling His Kingdom their home, for their ways are not His ways, and their lusts are not His love. We must become spiritual virgins who put no other god or idol before our Lord and Creator. With the cloak of grace, many Christians do not want to obey the Lord’s instructions, and we will find this truth confirmed during the ministry of the two witnesses, during the Apocalypse. The Lord’s message for Lot was for him to escape to the mountains, which is symbolic of a harder plight but greater exaltation upon completion, but Lot leaned upon his own judgment because of his fears. Many little towns and communities will be saved during the Great Tribulations and Year of Recompense, but those who fully obey God’s instructions for salvation will receive greater awards in the Kingdom than those who appeal to “greasy grace” to take the easier paths of their choosing. For many readers, all these passages and allusions to a gathering of the elect and an escape in this world- to the wilderness- are new, for religious denominations of Babylon and her daughters do not teach of the true Sukkot (Feast of Tabernacles) of the Apocalypse. In fact, Christianity and Judaism, as collective religions, have no such doctrine. The Holy Scriptures, however, clearly do, and Zion will escape persecution at the end of the age (again, Rev. 12:6, 14). The two witnesses will teach the elect of this escape. During the Great Sabbath millennium, the world will annually keep the International Feast of Tabernacles in honor of the faithful who obey (see Zech. 14:17-21). Nations that do not honor this message from Elijah, and seek to avoid the feast during the reign of Messiah, and not send their appropriate diplomats, will receive drought and loss of annual rain. God’s Word will be fulfilled, and it matters not if few, or even if none of the people, stand with Him. What does it mean for some of God’s people- faithful Christians and Jews- to be transformed into a pillar of salt? What becomes of the “salt of the earth”– the “Bride of Messiah”– when they, and their churches or synagogues, choose the world over God’s instructions for salvation? We see by the example of Lot’s wife that they must be left behind and fall short of the new life offered, so they cannot enter the coming Kingdom. Hence, they become dead religious monuments, as a pillar and sign of those who merely utilized religion while their hearts remained set upon worldly things. They created earthly doctrines to glorify themselves and their churches, and, perhaps, many of them had fear that led them to follow the Word. Yet they fell short somewhere en route. Fear of God is the beginning of godly wisdom, but obedience to His message of salvation is a must for those who seek to complete it. We cannot get stuck in time as statues of dead “saints” if we wish to follow the Lord in His living revelations to the completion of our salvation. Otherwise, we become like salt that has lost its flavor, as Christ said, worthy of being cast out or left standing still by the dead waters of the Dead Sea. Moreover, we must follow the living waters of the Word. We must look forward in faith and not back to what is passing away with judgment. Fiery tribulations will soon come upon the world- the likes of which have never been seen in previous wars and natural upheavals. Then the Messiah and His works will be known to the world, and every nation and its leaders, even Israel, will face His judgments. Let us pray for wisdom and grace, til Jerusalem is praised in the world as a righteous city, and the world is considered by the righteous a peaceful habitat, even for all who shall remain in the everlasting dominion of our universal King.